PASADENA, Calif. (CN) – A Ninth Circuit panel dealt a punishing blow to foie gras producers and enthusiasts on Friday by reviving a California ban in the back-and-forth battle over the ethics of the polarizing delicacy. 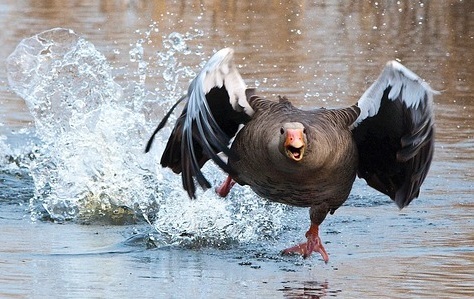 The plaintiffs – a group of foie gras producers and restaurants – had claimed California’s ban imposed an ingredient requirement by requiring that foie gras be made from birds that aren’t force-fed. Foie gras – fatty duck or goose liver – is prized for its rich flavor. But animal rights activists have long maintained the market for the delicacy drives poultry producers to cruelly force-feed the birds. During the feeding process, called gavage, large amounts of meal and air are pumped into a bird’s stomach through a tube inserted down its esophagus to enlarge its liver to 10 times its natural size. Calling the practice “inhumane,” California outlawed the sale of force-fed poultry products in 2004, although it allowed foie gras made from birds that weren’t force-fed to be sold in the state. Hot’s Restaurant Group in California, Hudson Valley Foie Gras in New York and the Association des Eleveurs de Canards et d’Oies du Quebec in Canada sued to overturn the ban the day after it went into effect in 2012, arguing it was preempted by PPIA because it imposes ingredient requirements over and above those the PPIA prescribes. Under PPIA, only the federal government can decide what ingredients go into poultry products. California countered the ban doesn’t address ingredients, but instead regulated the market by limiting the sale of products produced by force-feeding birds. U.S. District Judge Steven Wilson of the Central District of California sided with the plaintiffs, ruling in 2015 that the ban was expressly preempted by PPIA. Wilson permanently enjoined California from enforcing it. But in a move that could see foie gras again disappear from the state’s restaurant menus, the Ninth Circuit held Friday that PPIA’s ingredient requirements pertain to the physical components of a poultry product, not to farming or feeding practices. In sending the case back to Wilson, the panel also reasoned that the ban was not preempted even if it functioned as a total ban on foie gras. The Coalition for Humane and Ethical Farming Standards, a group that includes the plaintiffs, called the opinion “flawed” on Friday. But Wayne Pacelle, president and CEO of The Humane Society of the United States, said the panel made the right call. California Justice Department Attorney Aimee Feinberg, who represented the state, could not be reached for comment Friday. U.S. Circuit Judges John Owens and Harry Pregerson joined Nguyen in the opinion. Michael Tenenbaum of Santa Monica, California, represented the plaintiffs.